All lanes of I-95 North have reopened, hours after a fiery crash involving a tractor-trailer. 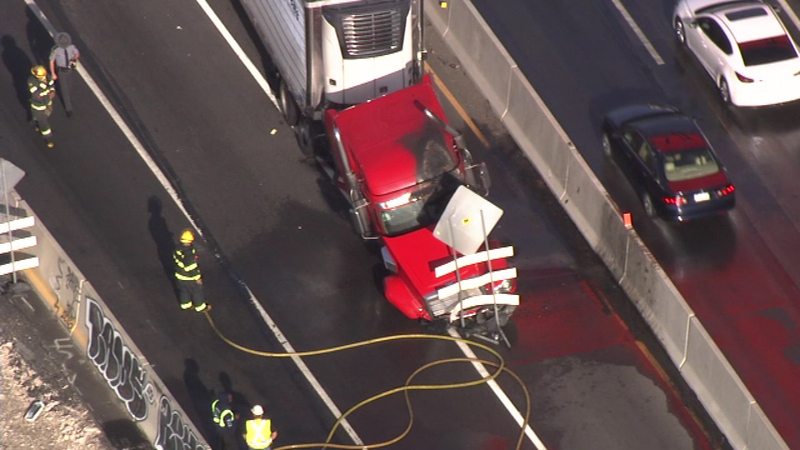 PORT RICHMOND (WPVI) -- Traffic is moving again on I-95 in the Port Richmond section of Philadelphia after a tractor-trailer crash and fire shut down the northbound lanes for several hours. The crash happened after 7 a.m. Wednesday in the northbound lanes near the Girard Avenue exit. Video from Chopper 6 HD showed a tractor-trailer which struck a construction sign and caught fire. The cab of the big rig showed fire damage and appeared to have lost one of its front wheels. A tractor-trailer crash and fire has shut down part of I-95 in the Port Richmond section of Philadelphia. All northbound lanes were closed as firefighters and hazardous materials crews addressed diesel fuel spill that resulted from incident. Northbound traffic was backed up for miles approaching the scene. Commuters were detoured off the highway onto the Vine Street Expressway for much of the morning. The big rig was finally moved and the fuel spilled cleaned up by 11 a.m., and all northbound lanes were reopened.